Located within a beautiful period terrace on a quiet road off Ladbroke Grove, this attractive studio flat offers bright modern living space with open-plan kitchen and shared bathroom. St Charles Square is ideally located for the restaurants, shops and bars of Notting Hill and Portobello Road. 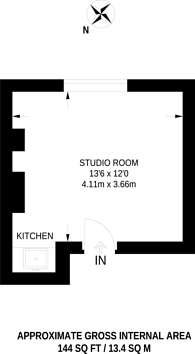 144 (13 Sq M) approx.